How to make our living space clean and safe again? Have you ever found yourself in a situation to notice dark spots on the wallpaper, the curtain of the shower cabin or the joints in the bathroom? Most likely, it is a fungus or mold and it represents a danger to our health. They are an indication of excessive humidity in our home. What is needed for the development of these fungi and mold? Although there are many ways and products to combat this problem, the 100% alcohol is suggested by many as the best and most effective (or, at least, easiest to use) way. If you do not have or cannot obtain it, experts recommend using at least 80% alcohol, as alcohol dilutes the moisture where it is applied as well. Other methods that are recommended and are very well known, but should not be used too often is a 5% solution of hydrogen peroxide and household cleaners with chlorine which require professional use as chlorine adversely affects human health. One of the most important rules in the “fight” against mold and fungi is preventing their creation. Moisture and its deposition in the house under normal conditions can be prevented by heating and ventilation. Moreover, the walls must be able to absorb a certain amount of moisture. With a proper care, maintenance, ventilation and heating of the home, you will largely maintain moisture in the normal allowable limits. The relative humidity in the home should be 65-70%. It is extremely important that the moisture that forms due to certain household activities (showering, cooking, washing) is regularly aired. The cold air from outside which enters during ventilation will become warm later by heating the room, adjusts to moisture and leaves the room. Cold air entering from outside into a warm room is in a good condition to dry the space even in a period when the weather is rainy. The cooler the air, the more moisture it can bind to itself. Therefore, ventilation of the room in winter is possible to remove more moisture than in the summer. Cleaning is not as simple a task as it appears at first glance. Incompetent cleaning can extend this issue through all the housing and the damage will be greater than the benefits. 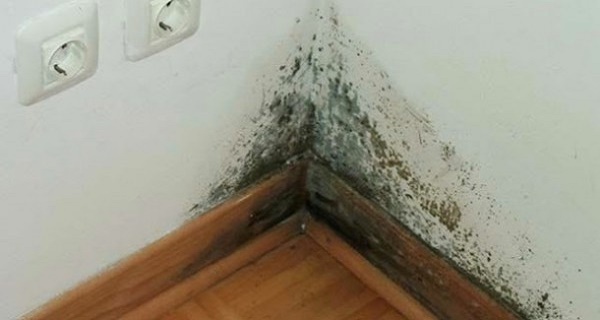 For example, if you have mold or fungi on the wallpaper, you need to remove it entirely from the wall, clean it- it is recommended to spray the problematic areas with water or with any other chemical (maybe Domestos) and not to wipe them, as the spores would spread throughout the living area. After some time, as soon as the sprayed area is dried, apply some color that contains a fungicide.